A simple tutorial on how to draw electron configurations efficiently, and how they are written. Electron configurations are simply the arrangements of the electrons located on an atom. 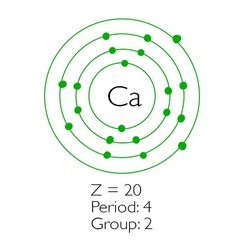 This is important to chemistry because the number of electron shells can affect certain properties such as electronegativity, and reactivity, and the number of valence (outer shell) electrons determines how an atom will bond with other atoms. In junior science, these are drawn with Bohr's model of the atom - the one that looks like planets orbiting the sun (see figure 1). These rings are electron shells, sometimes otherwise known as 'energy levels, (n)' (the further out from the nucleus, the higher the energy level), and they each have a limit to how many electrons that they can hold. n=3: The third shell can hold a maximum of 18 electrons, however this is where the rule falls apart so it is very unlikely that you will be asked to draw atoms of this size (anything larger than Argon, Z=18). The third shell tends to fill 8 electrons first, then 10 more later on (8+10 = 18). Draw one electron shell at a time and count the number of electrons that you assign to each shell until you run out of electrons. Examine the atomic number (Z) of the element, the period number (the row, 1-7), and group number (the column, 1-18) of the element. Fill all the electrons into the inside shells. Assign the valence electrons from the group number (The last digit of the group number is usually the number of valence electrons, e.g. group 13 has 3 valence electrons, group 2 has 2 valence electrons, group 18 has 8 valence electrons).